I'm just going to put it out there, its almost barbecue season. Not that I need any more excuse to eat burgers, but more of an excuse to try something a little different. 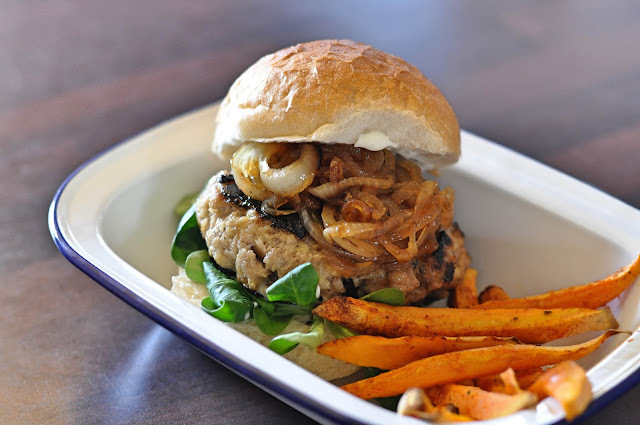 Making burgers at home is super simple and quick but I tend to stick to my trusty tried and tested tricks. Tricks like maple bacon with some squidgy avocado or some fiery sriracha mayo. Heat the oven to 200 degrees. Throw the sweet potato fries into a sandwich bag with the oil, paprika and season. Seal and shake until well coated. Place the fries in a single layer on the baking tray and bake for 20-25 minutes until the edges turn golden and start to crisp. For the burgers, squeeze out the sausage meat from your sausages into a bowl or pork mince. Add the grated apple, season and mix well. Divide the mixture into 4 and form into equally shaped patties. Set aside on a plate. Heat the oil in a pan over a medium heat. Add the onions and a pinch of salt. Cook stirring occasionally until the onions soften and start to brown around the edges. Add the sugar and cider, mix together and turn up to a high heat. Leave for 10 minutes, stirring occasionally until the cider has evaporated. Meanwhile, heat a griddle pan until smoking hot and add the burgers. Cook on each side for 3 minutes. Once cooked, leave to rest. Gently toast the cut sides of the burger buns on the griddle pan before spreading some mayonnaise over the bases and add some leaves. Top each with a burger and generous helping of sticky onions. Serve with sweet potato fries. Now I'm well and truly in the mood for sunshine I can't wait to create some Waddlegoose cocktails too! Find out more on Waddlegoose and stockists, here. Thanks to Aspall and Waddlegoose for sending me a box of cider to give me the barbecue feeling! I was not paid for this post, my love for burgers is my own. Ohh sounds delish! I cooked with pork mince the other day for the first time in ages and I had forgotten how flavourful it is! 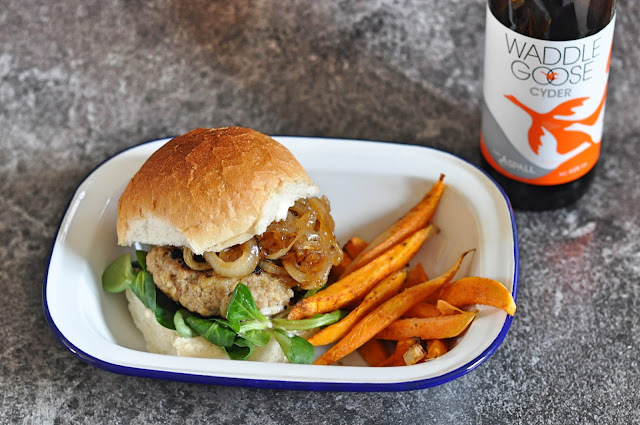 I'd never think to make pork burgers at home but love pork and apple combo so why not!! And those onions sound delish! OMG your burger knowledge is amazing. These look immense. Feed me.